Healthy employees mean happy, productive employees and a positive work environment, so we take health pretty seriously. In manufacturing companies like ours, factory employees often stand for many hours of the day sometimes with repetitive motions that can cause occasional muscle strain. Office employees have their share of challenges, hunched over their desks pumping out emails most of the day. 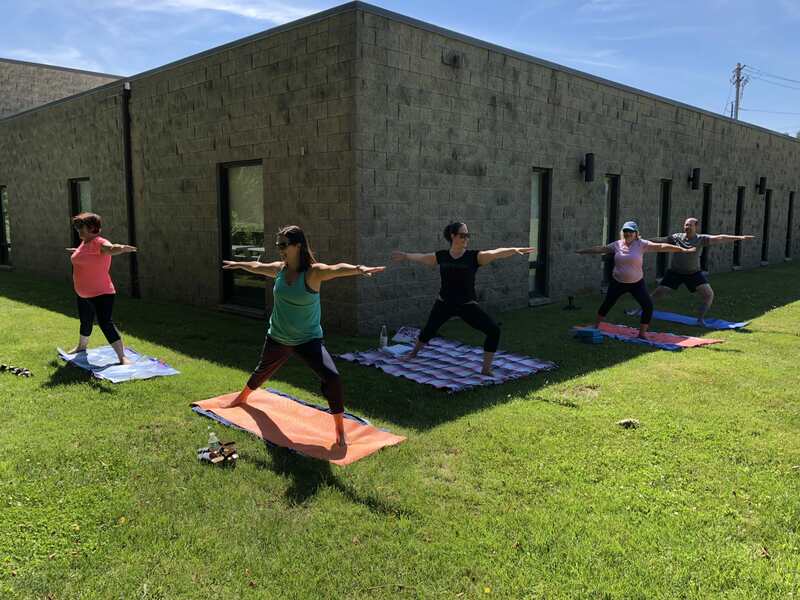 Weekly onsite yoga – Nothing feels better than stretching our bodies after a long hard day. The benefits of yoga seem endless, including better posture, protection from injury and increased flexibility. Our favorite part Becky’s class, of course, is Shavasana – a corpse-like pose at the end of the class where most of us fall asleep. Standing Workstations – According to Tony Robbins, “Sitting is the new smoking”. In the office, sitting starts with the car ride to work and continues all day long at our desks or in meetings. It’s a sedentary day that often leaves me with a step count so low, I’m convinced my Fitbit is broken. Since we’ve added standing stations – some retro-fit onto existing desks – the workday has vastly improved. Birthday Cake or Fruit – I’ll admit I’m the first to appear when there’s birthday cake in the break room, but that’s a lot of cake over the course of a year… and the sugar crash that follows is no bueno. We recently implemented a Cake or Fruit option, where the birthday guy or gal gets to choose. Please choose fruit, please choose fruit. Walking Meetings – This hasn’t been widely adopted yet (as living in New England only leaves us about one-third of the year), but walking meetings are certainly encouraged. Of course, there’s more we can do, but it’s a good start. Many companies say wellness is important to them, but few seem to offer anything other than discounted gym memberships. What does your workplace offer?